This bird makes a chertee cherTEE cherTEE CHERTEE CHERTEE (usually five times) noise that really grabs your attention. The song increases in volume and is quite loud. This particular bird wasn't moving around a lot, so my eyes didn't notice him right away because he blended in so well with the tree. "They are common in mature deciduous or mixed forests with sparse shaded undergrowth. Seen mainly on the ground, walking with high-stepping gait and head-bobbing; often with tail raised. Olive above, white below, with distinct black streaks." (The Sibley Field Guide to Birds of Eastern North America). 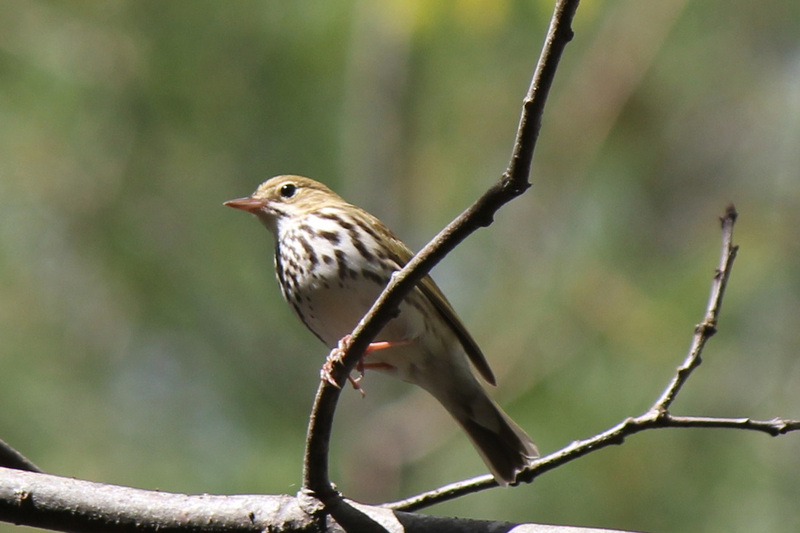 From Merlin: The Ovenbird's rapid-fire teacher-teacher-teacher song rings out in summer hardwood forests from the Mid-Atlantic states to northeastern British Columbia. It’s so loud that it may come as a surprise to find this inconspicuous warbler strutting like a tiny chicken across the dim forest floor. Its olive-brown back and spotted breast are excellent disguise as it gleans invertebrates from the leaf litter. Its nest, a leaf-covered dome resembling an old-fashioned outdoor oven, gives the Ovenbird its name. Size & Shape - The Ovenbird is a chunky, larger-than-average warbler, but still smaller than a Song Sparrow. It has a round head, fairly thick bill for a warbler, and a jaunty tail often cocked upward. Color Pattern - Ovenbirds are olive-green above and spotted below, with bold black-and-orange crown stripes. A white eyering gives it a somewhat surprised expression. Like several other terrestrial, or near-terrestrial, warblers, Ovenbirds have pink legs. Behavior - Ovenbirds spend much of their time foraging on the ground, often walking with a herky-jerky, wandering stroll that is unlike most terrestrial songbirds. Territorial males are very vocal and often sing from tree branches, occasionally quite high up. This is one of the few songbirds that habitually sings in the heat of midafternoon. Habitat - Ovenbirds breed in closed-canopy forests, particularly deciduous and mixed deciduous-coniferous woods. You may find them in most forest types, from rich oak or maple woods to dry pine forest, although they avoid wet or swampy areas.